An Asian restaurant is a very popular eating establishment because consumers know that they are more likely to find healthy menu options when they opt for Asian cuisine over a burger and fries. It's important to make sure that your Asian menu features some healthy food options. It's also important to make healthy decisions across the board for your entire menu. This will encourage health-conscious consumers to choose your restaurant among the thousands of less healthy options available. There is no need to sacrifice flavor when attempting to improve the health factor of your Asian menu. Asian cuisne naturaly offers more vegetables in its main courses and making a few subtle adjustments is often all that is necessary to make your customers feel like their health is in good hands. The biggest source of hidden, dangerous fat in an Asian restaurant is often the oils that are used to cook and prepare food. A full Asian menu cannot be prepared without cooking oil. Oil adds fat and flavor to the foods prepared, and it also ensures that food doesn't stick to pans or burn during the cooking process. Instead of hydrogenated, artificial oils like canola oil, consider using healthier oils like coconut oil or olive oil. Coconut oil can be safely used at high temperatures as its smoking point is perfect for wok cooking. While olive oil, which should not be used in high heat wok cooking, is best used in its raw, uncooked form and can be used in salads and dressings. These "good" fats are becoming quite popular among consumers. Another way that you can improve the health factor of your Asian menu is to offer whole grains in place of white, starchy grains. Whole grains often contain the same amount of carbohydrates as do white grains, but the carbs contained in whole grains are more complex. Therefore, they don't turn into sugar immediately after they are digested. Substituting brown rice for white rice is one of the easiest fixes for the carbohydrate issue. 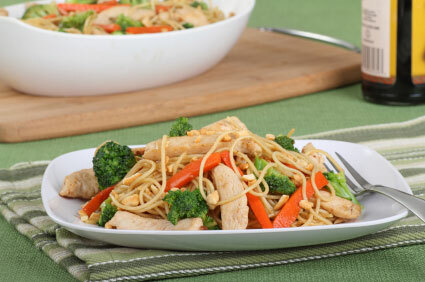 Lean meat such as chicken, turkey, or fish is a great way to add a healthy aspect to your Asian menu. Lean meats are an excellent source of protein. They contain as much protein, or more, than red meats, but they do not have the extra fat and cholesterol that many consumers must avoid in order to stay healthy. Filling your menu with these healthy options will appeal to a wider base of customers and make all your Asian food healthier. It is also important to be aware of many special health and dietary needs your customers may have such as intolerances or allergies to certain foods. Many people are allergic to shellfish or eggs, so you must be sure that the food in the kitchen is not cross-contaminated with these common Asian ingredients. If a customer chooses a meal without these allergenic food items, he or she should be able to expect that the finished dish will not contain even trace amounts of these items. Gluten insensitivity or allergy, often referred to as Celiac's Disease, is another important health requirement to consider. Individuals who suffer from this ailment cannot tolerate gluten of any kind, so you must make your staff aware of the foods that contain gluten and ensure that several gluten free menu items are available.